With the war in Syria underway and the tragic attacks in Paris, now more then ever it’s time for a call to peace. 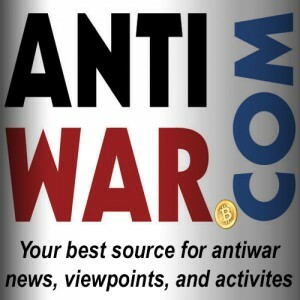 Antiwar.com is the leading news site with Anti War news, reviews and activities, but we need your voice. Over the weekend Antiwar held a successful social media campaign with the hashtag #WhyIAmAntiwar; hundreds of people wrote in with answers to this incredibly important question. 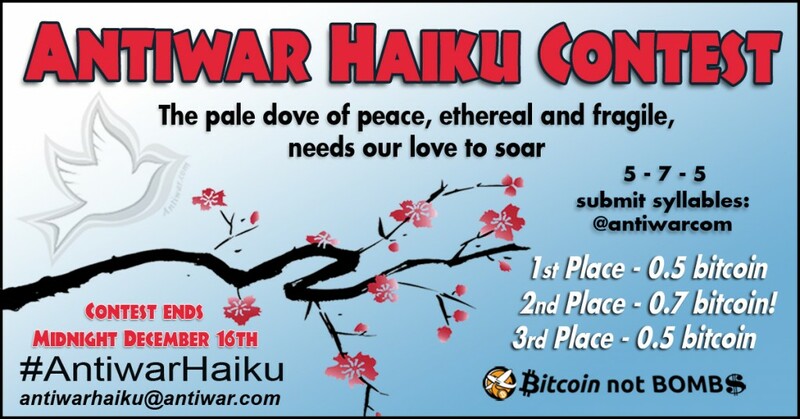 Now we aim to encourage even more creativity with the #AntiwarHaiku contest. Antiwar.com is looking for your best Pro Peace Haikus. This is your chance to inspire and show the positive side of the liberty movement. Bring your best pro peace prose to counter the constant negative news and debates we are all tired of. It’s time to send a message of peace to the world. “Peace on Earth” isn’t just a holiday card – let’s make it resonate far and wide. Make your point in a clear 5-7-5 syllable Haiku and submit your entry for a chance to win. 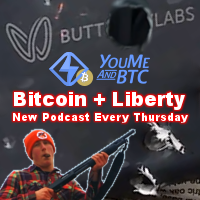 We have lined up some great prizes from some of the strongest supporters of peace in our community, including .5 BTC .7BTC and .5 BTC for the top 3 winners. There is no limit on the number of poems you can submit. The contest runs from now until midnight on December the 16th. 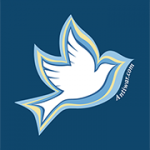 Once your entry is submitted to the official email address: (AntiwarHaiku@antiwar.com) please tweet/facebook/instagram your haiku @antiwarcom with the hashtag #AntiwarHaiku so your message of peace can be seen. 3rd place and first place get the same prize and second gets more? 1st place also gets a signed book and bragging rights to being first place. So they get more. You can’t win if you don’t play!